Carol Phillips sent this picture of Susan B, who cast a quizzical look at her admirers from the grassy edge of the gorge wall near the High Falls. Carol took this picture from the observation deck just to the east of the falls. It gives the watchers a great look at the fledglings as they fly along the river. 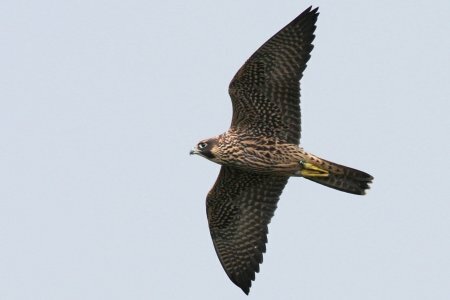 And if they land on the edge of the gorge it’s a great spot to take pictures of the young falcons too! What a stroke of good fortune for Joyce and for us that Seneca made such a great pass before the rain set in! Here’s Diamante, doing a little preening while sitting on a tree branch near the pedestrian bridge. Falcon watcher and Rochester Falconcam team member Jim Pisello got this shot while he was waiting to catch an action shot of Diamante taking off. Jim notes that he watched Diamante in the tree for almost half an hour. He never did get that takeoff shot, but he tells us that he thinks this is a more interesting photo because of Diamante’s odd pose. 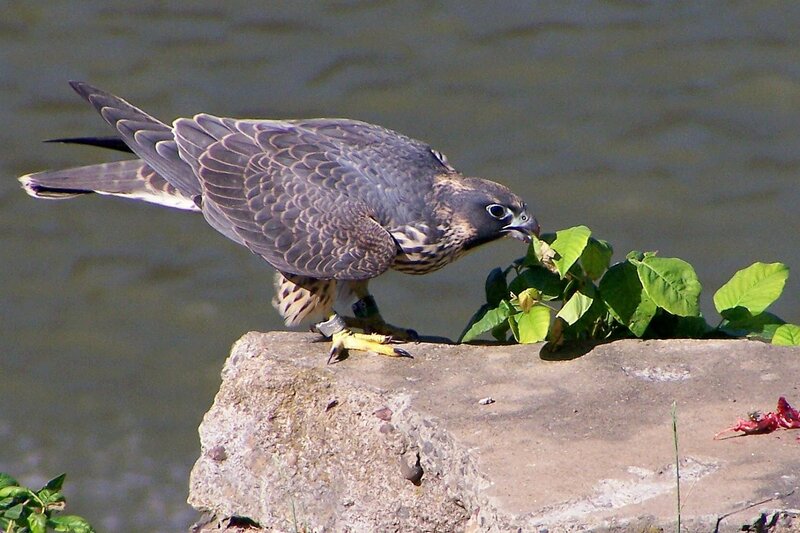 Fledge Watcher and Rochester Falconcam team member Carol Phillips kicks off our 2008 Gallery at Imprints with a terrific shot of Seneca adding some roughage to her diet after consuming a pigeon earlier this week. She wasn’t really going vegan on us– Peregrines are pretty strict carnivores– but it’s a fun image don’t you think? The breakfast left-overs are visible in the lower right corner of the image– don’t look there if you’re squeamish! Once again we’d like to invite our local fledge watchers to submit pictures they’ve taken of Mariah, Kaver or this year’s great group of fledglings, to the 2008 Gallery at Imprints! 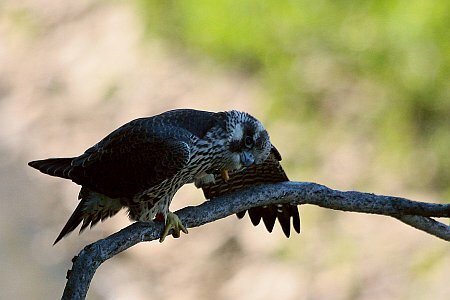 Every few days we’ll host a new picture on the Rochester Falconcam’s home page, and we’ll provide details about the photo and the photographer here. 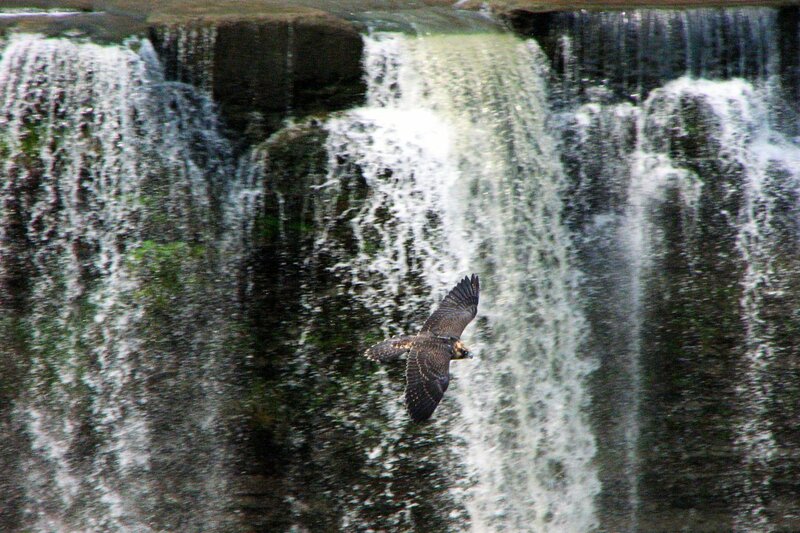 And just like last year, we’ll feature the gallery images in the 2009 Rochester Falconcam Calendar. To get started, just review our Submission Guidelines! 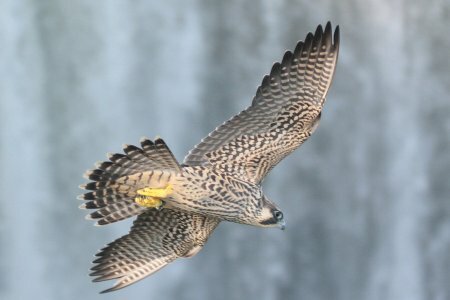 The Rochester Falconcam wants to thank the many talented photographers whose images help bring the wonder and excitement of the Rochester peregrines to our viewers around the world. 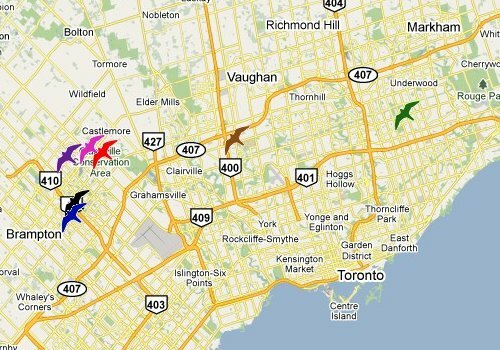 It’s getting close to the time when we’ll launch the 2008 Rochester Falconcam! While we wait, we hope you’ll enjoy this slideshow of terrific photos taken by our fledge watchers and posted in our 2007 Gallery at Imprints. Our friends at Kodak have introduced a new website that makes it easy to create dynamic slideshows like this one from any KodakGallery album (We created one from the Freedom 2005 album too). 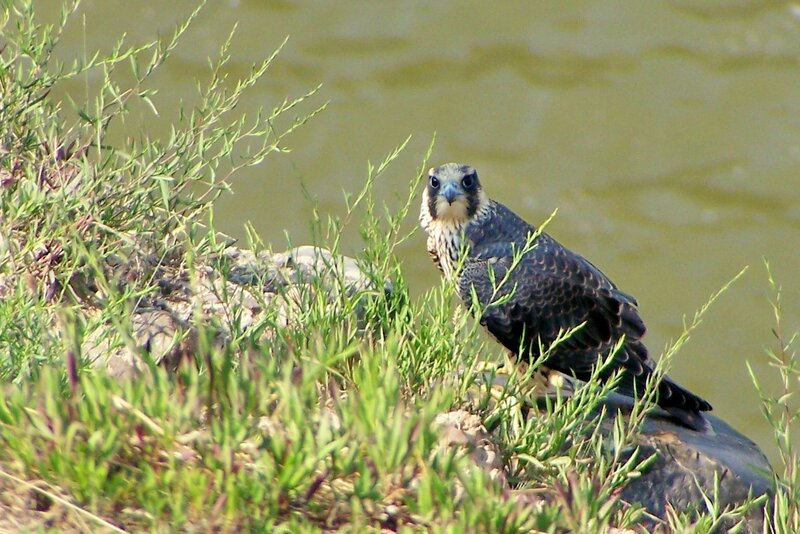 You can visit all of the Rochester Falconcam Slideshows, or try it out for yourself!